I haven’t always been a big fan of salmon, or any other fish that, well, tastes like fish. But it many instances, I have had salmon prepared a certain way so that the fish flavor was barely there, and the sauce was just so amazing, I would have eaten just about anything that was covered in. 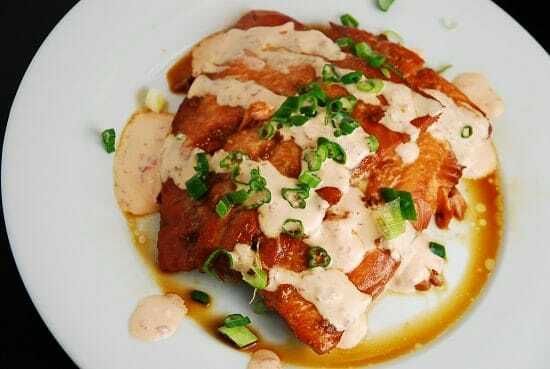 This Chili Glazed Salmon with Siracha Cream Sauce Recipe is one of those instances. I had some fresh salmon on hand, and went to work creating a deliciously sweet chili glaze sauce, and then went a step further and made a quick Siracha cream sauce. The combination of the two flavors was excellent, and my husband and I both really enjoyed this Weight Watchers salmon recipe. I’m so happy that I’ve found another great way to get more salmon in my diet! Enjoy. A sweet and spicy spin on this salmon recipe will have your mouth watering. The sweet chili glaze works in perfect harmony with the spicy Sriracha cream sauce to make this one delicious Weight Watchers dinner recipe. To make chili glaze for the salmon, combine chili sauce, soy sauce, ginger, brown sugar, and 3 garlic cloves. Mix well. Line a rimmed baking sheet with foil or parchment paper, and spray with an olive oil mister or non-fat cooking spray. Place salmon on baking sheet, and spoon glaze evenly over each fillet. Let sit at room temperature for 30 minutes. While salmon is marinating, make Sriracha cream sauce by combining yogurt, mayo, Sriracha, lemon juice, salt and remaining garlic clove. Mix well and set aside. Preheat broiler, and spoon any marinade remaining on baking sheet over salmon fillets. Broil salmon without turning until cooked through, about 8 to 10 minutes, depending on thickness of fillet. Serve each salmon fillet with a drizzle of the Sriracha cream sauce and garnish with green onions. What type of chili sauce? Any standard brand of chili sauce will do. Was good, but WAY too salty! 1 teaspoon salt? I don’t normally use much salt so I found this excessive. Next time I make it (and I will) I would knock the salt down to 1/4 teaspoon. Pretty spicy too, so I might take that down a notch. It was a tad salty but otherwise tasty. The heat really sneaks up on you quickly! WOW! I made this tonight for dinner and it was FANTASTIC! This recipe is a keeper for sure. I didn’t have any greek yogurt in the house so I used regular, but my sauce seemed to come out fine just the same. I also paired this with a very light, 3-ingredient avocado salsa (just avocado, red onion, and lime oil) which I would highly recommend. Thank you for posting!! I know others have asked about the kind of chili sauce used for the glaze, but I’m still unclear about what to use. Is it like a sweet chili sauce, or that super-spicy garlic chili sauce? Or neither? I made this tonight and it was fantastic! Thank you!! Ok, I always use on-line recipes, and I never write reviews, but this one was so unbelievably good, I had to come back to tell you how much I loved it. Seriously…everything was so delicious! AND…the finished product looked exactly like your photo. I was a little concerned when the glaze burned a bit in the oven. I took out the salmon sooner than I would have normally because of that and was worried that it was going to be undercooked. NOT A BIT. It was perfect. I love the sauce, too, and have made it since to go on other things. My boyfriend loves Sriracha and it tends to be a little hot for me, so this sauce is a good compromise. Thank you! Also, I pinned it and posted it to my FB page! I made this tonight, and it was fantastic! I learned something a couple of months back about not over cooking salmon ,because it will taste fishy. I took mine out at almost 6 minutes, and it was perfect. Winner in our book! Made this tonight with Cilantro Lime Quinoa. Great combo, and I LOVE the glaze! I used the Asian chili sauce which seemed like it would be too spicy before I cooked it, but it must cook down the heat because it was perfect! Plus, the sriracha is milder when mixed with the mayo and yogurt. This was so good!!! I made quinoa and steamed broccoli as my sides. I am loving the sound of this! Is this like an asian chili sauce or like the heinz ketchup chili sauce? I just want to clarify so I do not use the wrong ingredient! Thank you! Did you guys find out about the chili sauce .. I too am wondering!! This looks so yummy! I’m the same way – not a big fan of salmon unless the fishy flavor is minimal. I will be making this recipe. And I love that it’s only 4 points per serving.